The best camera, they say, is the one you have with you. That’s why it’s no surprise smartphones are quickly replacing point-and-shoots, and now that we have the Sony Xperia Z the boundary is pushed towards waterproofing those devices. This will only make them better of course, and we hope the Xperia Z is one of many to come. Right now, though, we have the first underwater video shot entirely on the Sony Xperia Z and it has the device filming some fun time in a swimming pool. The Xperia Z is IP57 certified device. Each of the letters in the IP certification has a particular meaning with the 5 standing for “limited dust ingress protection” and the 7 for “Protected against immersion between 15cm and 1m depth” for a duration of up to 30 minutes. That of course means the Xperia Z had no problems shooting a 3 minute video in a pool. Still, we can’t help but be impressed with the device thinking about all the great shots we missed at the beach and pool. We also have a full review of the Xperia Z, so make sure to check it out. They should've focused on land camera performance instead of underwater, same goes for the screen viewing over making it idiot-proof. Dolphins are the target market. Yea probably they want it for recording how they are tortured in Japanese waters so that IOC could consider turning down Japan's 2020 bid for Olympics. maybe just feelin bitter because sammy and nokia can't do it with their high end devices. it's the same thing with why would you want to have a camera that can take good low light photos. are you spying on someone behind the shadows? why do you need a splitting screen while watching a movie and monitoring the stock market on your GN when you can just buy two diferent devices at lower prices? these new features serve some good purposes but fans of competing brands just refuse to acknowledge that they can also be useful. This is a phone for LIFEGUARD. If baywatch still on tv, I bet sony will give David Hasselhoff and the team a Sony Xperia Z.
you wouldn't be too stupid to take a device to water with you when you know the device can't endure getting in contact with water. you will by a waterproofing case first. invalid argument. please, if you support xz, make more sensible comments. sony fans need to have some class unlike those brainwashed sammy cult followers. Why would I go underwater WITH A PHONE! Hello? But gotta give props for marketing. Dusting off $300 extra profit never was this easy. Maybe you won't, but maybe other will, world is big and there is more people than only you! I even don't talk that there still is a chance that phone may get wet by accident and that's mean IP57 certificate is advantage not disadvantage! Sony fanatics already wet themselves so I guess the IP57 certificate comes handy ;) but I tell you right now: SIX WEEKS and dozens of them will storm forums infuriated, claiming Sony cheated them cause the phone went to the crapper on their first jump into the swimming pool. Which of course is because it's not really an underwater gadget as the video advertises, the 1m resistance is not enough even for pocket depth, and most ppl's hands go below that while swimming. There will be lawsuits by ppl. who accidentally dropped the phone while fooling around in the pool or sea as 3 feets under is game over, so the world might be big, but the Z's underwater resitance is quite shallow. The question is not why, but why not. Sometimes data inside the phone is more worth than a phone by itself so IP57 certificate is handy advantage for a phone even if you won't going to dive in to the pool with it. I even don't talk that there still is a chance that phone may get wet by any other accidents than only a pool. Read more reviews of the Z. The only one where they troll the camera is in this Samsung site. Phone Arena is a well know Sony hater site, look at the reviews of their phones and compare it with samsung. Just the Xperia P and the GS3 Mini one is a disgrace. Or they tested all phones unlike you, therefore have an objective view. A poll would probably make the S3 the phone of the year, yet it didn't even make PhoneArena top3 of 2012, where a Samsung landed both in the worst phone and worst tablet category. So your suggestion of preferential treatment is complete rubbish. the inconsistency in their comparison findings makes everything dubious. lumia getting beaten in lowlight? forget about the possibility that the xz used here is defective or has been made to work to its disadvantage. if there's one thing the lumia is known for, it's its photography skills. the inconsistency here is suspect. Sony has stated that the phone at CES was a prototype. The final version has an IPS with same view angles as the droid dna. The final version is much better than the prototype that most of the reviews are based on. Sony has also done an amazing job at hardware driver optimization and this phone beats the Droid DNA in benchmarks. i heard the same thing as well. hope it come true. "A Sony representative also claimed the pre-production/DEMO/beta models were made using cheap materials and also the screen was glued by hand and not set properly as the production models, simply because they wanted the devices to be ready for CES 2013 and due to the amount of demo units they wanted to send out asap and that the production models would be better. " The final versions view angles are fine. It's so easy when you can't think of anything else to trash-talk about on this device, other than its already great land camera performance (which works equally well on land AND under water, and that's something you simply cannot find in other phones at this time) and the viewing angles are already very decent. There is no smartphone right now that fits those perfect specs but the Xperia Z is the closest you can find. So, for the haters, keep away from the keyboard and just keep waiting. One of the many amazing uses i have planned when i get my pre-ordered Xperia Z is the ability to take it with me on vacations and keep it with me all the time, despite any type of bad weather (rain, sand or dust storms) and not have to worry about the phone at all. When on my next swimming trip (lake, sea or whatever), i no longer have to leave it behind on land (and worry about someone snooping or outright stealing my beautiful 5" device) and the best part is while snorkelling, i can now take pictures of underwater marine life which has always fascinated me. I no longer have to try and describe to my friends what i saw in the water that day. A quick reach for my (for safety of not losing it into the abyss, wrist-strapped) Xperia Z and that unique moment is immortalized. I'm no professional diver or underwater photographer that would consider investing in $1000+ special underwater cameras, so the Xperia Z is makes complete sense and the underwater camera functionality is absolutely perfect. Thanks, and those who thumb down, i hope you'll find a way to get in a lake or sea, some day in your life. now dats a smartphone ...dat can be truely urs no matter where u go and what u do !... beast which doesnt come wid "handle me wid care" tag ..atleast i want to spend less time worrying about my phone !! You must fall into the sewer quite often laddy. I'm sure everyone sometime in their life time will have their phone dropped into water or have water spilled on it. Better to be safe than sorry. I will NEVER buy another sony phone.. In terms of comparable pricing to features, Sony phones are drastically overpriced and do not provide any significant features to justify their high costs. Sony does not offer anything but subpar performance and their support in terms of software updates, is by far the worst I've seen. 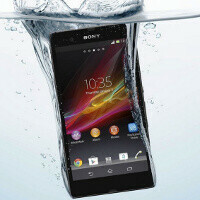 The Xperia Z would probably never see the likes of KLP, it should be tossed in a pool and left there. so you can buy Iphone with its affordable price. LOL.